We digitized and gridded (c3stsimong) an isopach map of thickness of the Mt. 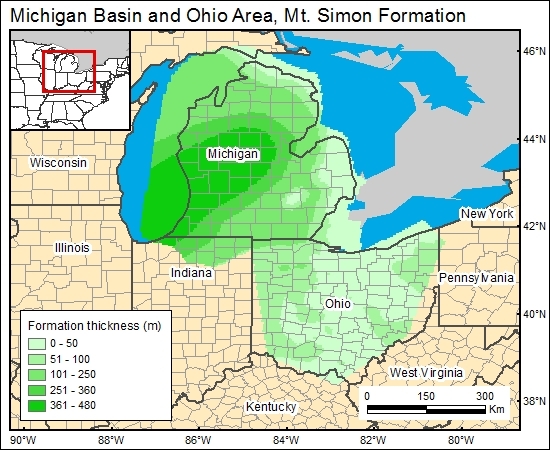 Simon (Catacosinos and others, 1986) in the Michigan Basin and gridded a point coverage of thickness of the Mt. Simon derived from the data base of Gupta (digital communication, 1999) for the Ohio area. Catacosinos, P. A., and Daniels, P. A., Jr., 1986, Stratigraphy of middle Proterozoic to Middle Ordovician formations of the Michigan Basin, in Catacosinos, P. A., and Daniels, P. A., Jr., eds., Early sedimentary evolution of the Michigan Basin: Geological Society of America, Special Paper 256, p. 53-71.